MARK: Can you please tell us a bit more about IMPOSSIBILIA, such as where the title comes from, how it came to be and the process of putting the book together? DOUG: Early in 2007, I was discussing the possibility of a short fiction collection with PS Publishing, a small UK press that specializes in SF, fantasy, horror and crime. MARK: These are some fantastic "Easter eggs" you've added into your tales. And it's interesting you should bring up "Symphony" because I wanted to mention that story and "Spirit Dance" and what seems to be a recurring theme of lyrics, dance and music in your writing. Does this mean there's not just a hidden poet inside of you but perhaps a musician? DOUG: Well, if there's a musician inside me, he's not just hiding--he's in a witness protection program. Mark: In "The Dancer at the Red Door" you touch upon all the senses quite wonderfully. Can you discuss how you use these sensual touchpoints to draw the reader into your fiction? Toronto's annual Ad Astra con this year found all five Aurora Award nominees for "Best Short Form" in attendance. 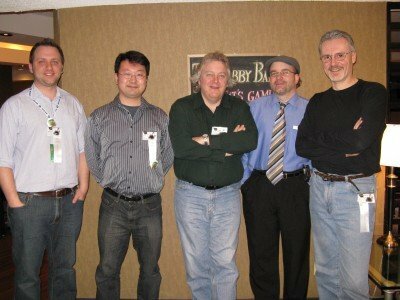 Pictured here, left to right, are Stephen Kotowych, Tony Pi, Hayden Trenholm, David Clink, and yours truly. You can read my nominated story, "The Dancer at the Red Door," here. Ad Astra is always a great con, and I highly recommend it if you've never attended. I mentioned in my last entry that the long-running Czech pro magazine, Ikarie, had reprinted my Aurora-winning story "Scream Angel." Two issues later, they also reprinted its companion story, "Enlightenment", a 2005 Aurora Award finalist. Check out reviews and the story's publishing history.